This is the most "meh" thing ever, it's not really awful or anything, but it just has nothing going on for it. It doesn't offer anything new or interesting, might as well just watch any of the old Getter Robo and Mazinger TV series. I won't deny that at the very least it looks nice and while still obviously old, it doesn't feel too dated and hard to watch. But this is where my "praise" ends, there are no interesting or cool interactions between the casts, they already knew of each others existence so no introductions or maybe some sort of confusion and that ending in them fighting. I was surprised that this is even a movie, because it feels like a random episode. There is no real buildup or anything, them teaming up happened when there were less than 10 minutes left. The worst part is that it's not "versus", I still don't know why older shows do things like that where they put versus in the title, but instead of fighting with each other they always fight together. I don't even hate this, that's why I rate it with a 5 rather than something negative. It's just there, it does nothing interesting, but it doesn't make me annoyed or angry as well. 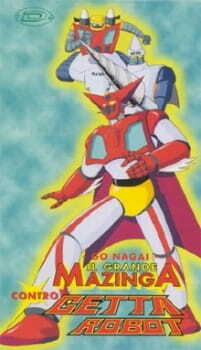 Great Mazinger vs. Getter Robo, crossover aside, is a very typical 70s super robot anime. If you're aware of this special's existence, then you should know what that entails and how much you'll enjoy this. You'll either like the retro style and all its cliches or find it outdated and dull. To be frank, I'm in the middle of that. I like the classic style every once in a while in the right dosages. Being a kids' show, it can easily put a smile on any mecha fan's face, and the Mazinger and Getter Robo franchises are the most beloved out of all super robot anime. Seeing these familiar faces and attacks are consoling until the effect wears off and you realize how repetitive and predictable what you're watching is. Since this special is only thirty minutes, that fortunately doesn't have time to kick in. Well, anyway... A UFO drops a new monster called GilGilGan down on Japan, and both Great Mazinger and Getter Robo find him hard to deal with. A plan is devised for Great Mazinger and Getter Robo to work together and defeat this powerful new enemy. There's a joy in seeing these icons on the same screen together, but other than that their union doesn't elevate the old super robot formula beyond what it always is. The same attacks are used as always and once the monster is beaten things go back to normal. That's where I was expecting more from this special. The casts of each anime are already aware of each other's existence so there aren't any cool introductions to see between them, and since they're busy fighting most of the time we don't get to see the pilots' personalities interact much. There aren't any cool combination attacks like Thunder Getter Beam or anything like that, so this is pretty standard. That's really all there is to it. The fact is, you already know if you're going to like this or not. If you need to check out a review to decide to watch it, you won't.